The prevalence of cardiovascular diseases is rising. Therefore, adequate risk prediction and identification of its determinants is increasingly important. The Rotterdam Study is a prospective population-based cohort study ongoing since 1990 in the city of Rotterdam, The Netherlands. One of the main targets of the Rotterdam Study is to identify the determinants and prognosis of cardiovascular diseases. Case finding in epidemiological studies is strongly depending on various sources of followup and clear outcome definitions. The sources used for collection of data in the Rotterdam Study are diverse and the definitions of outcomes in the Rotterdam Study have changed due to the introduction of novel diagnostics and therapeutic interventions. This article gives the methods for data collection and the up-to-date definitions of the cardiac outcomes based on international guidelines, including the recently adopted cardiovascular disease mortality definitions. 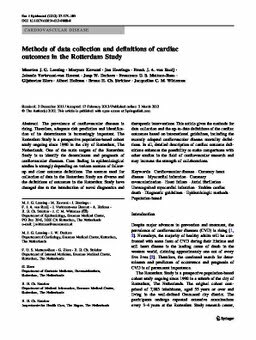 In all, detailed description of cardiac outcome definitions enhances the possibility to make comparisons with other studies in the field of cardiovascular research and may increase the strength of collaborations.